Can cryptocurrencies save Indonesia’s carbon forests? Blockchain technology is already connecting buyers and sellers around the world, even if they don’t trust each other. It’s cutting through bureaucracy, and bypassing corrupt governments, all with just a few strings of code. The technology could even save Indonesia’s forests. Over the next few months, several flagging carbon forestry projects are hoping the Bitcoin bubble can carry them to new heights of market capitalization. These Reducing Emissions from Deforestation and Forest Degradation (REDD+) projects are part of an international mechanism designed to make forests more valuable standing than cut down. The idea behind these projects was born in Indonesia in 2007, but, for multiple reasons, REDD+ never really took off. 95 percent of the world’s ‘avoided deforestation’ credits, representing millions of hectares of conserved forest, were stuck without a buyer. Until now. Blockchain technology is already connecting buyers and sellers around the world, even if they don’t trust each other. It’s cutting through bureaucracy and bypassing corrupt governments, all with just a few strings of code. The technology could even save Indonesia’s forests. The growing hype around cryptocurrencies like Bitcoin is nowhere more obvious than in Indonesia. Despite being illegal as a transaction mechanism, Indonesians are moving $15-20 million worth of digital currency every single day. Although Bitcoin holds by far the biggest market share, alternatives (alt-coins) are catching up, and new ones flood the global crypto-exchanges almost daily. There are now over 1,500 listed alt-coins touting for investment through the sale of tokens. These tokens are often sold speculatively, like shares in a new company, or given as incentives to people who offer their computer power, which enables the network. The encoded tokens represent blocks of data stored on the network. Some of these cryptocurrencies offer game-changing blockchain technology to their respective market sectors. Others are completely bogus. With no central regulator, it’s often difficult to know what’s what. While Bitcoin was the first application of blockchain technology, ‘Bitcoin’ should not be used to mean ‘blockchain’, which is a much broader idea. Cryptocurrencies are but one use of blockchain technology. Other applications include government record-keeping, tracking the flow of goods and services along supply chains, voting, and verifying the identity of citizens. A blockchain is essentially a distributed database. What makes the technology unique is its ability to enable the storage of data immutably, without relying on a central authority. This allows the database to preserve its integrity and prevent hacking or other forms of monkey business. Over the next few months, several flagging carbon forestry projects are hoping the Bitcoin bubble can carry them to new heights of market capitalization. 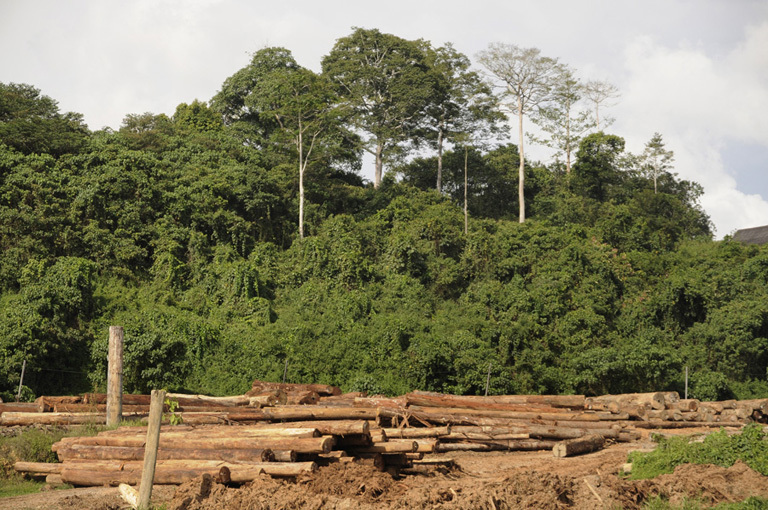 These Reducing Emissions from Deforestation and Forest Degradation (REDD+) projects are part of an international mechanism designed to make forests more valuable standing than cut down. The idea behind these projects was born in Indonesia in 2007, but, for multiple reasons, REDD+ never really took off. 95 percent of the world’s ‘avoided deforestation’ credits, representing millions of hectares of conserved forest, were stuck without a buyer. Until now. Ecosphere+ is providing carbon credits to its strategic partner, Poseidon, for use on a blockchain platform. This will allow consumers and retailers to track and offset their carbon footprints. Meanwhile, Veridium Labs and Infinite Earth, who launched Central Kalimantan’s Rimba Raya REDD+ project in 2008, are jumping on the blockchain bandwagon, this time with a new kind of credit card, VerdePay. The card allows consumers to purchase anything from handbags to SUVs, while autonomous computer programs issue REDD+ carbon credits via the blockchain, offsetting the embodied carbon footprint of each purchase. Unlike the smoke and mirrors of some previous carbon offset projects, using self-executing code means there’s no mystery fees or middle men taking a cut, just fully transparent, non-partisan algorithms guaranteeing everything stays above board. The sale of Verde tokens also funds community development and biodiversity conservation initiatives. Infinite Earth’s Todd Lemons announced at a $2,000-a-head blockchain conference in New York last month that such environmental and social benefits can be coded into a token and executed automatically. Lemons said, “We hope the tokens will provide less friction and a much higher adoption rate.” The company expects the experiment to offset an average of 4.4 million metric tons of pollution per year, enabling the Rimba Raya Reserve to stay up and running for 60 years. The project brings together blockchain developers at IBM, funders seeking a greener image like BP, Gazprom, and Shell, and financial services companies like Allianz and Zurich, all promoting environmental and social transformation. Without a doubt, blockchain is providing these bedfellows with more efficient ways of connecting Indonesia’s carbon projects and global communities of eco-conscience consumers. But will Indonesia’s forest communities get a share of the goodies? Probably not. 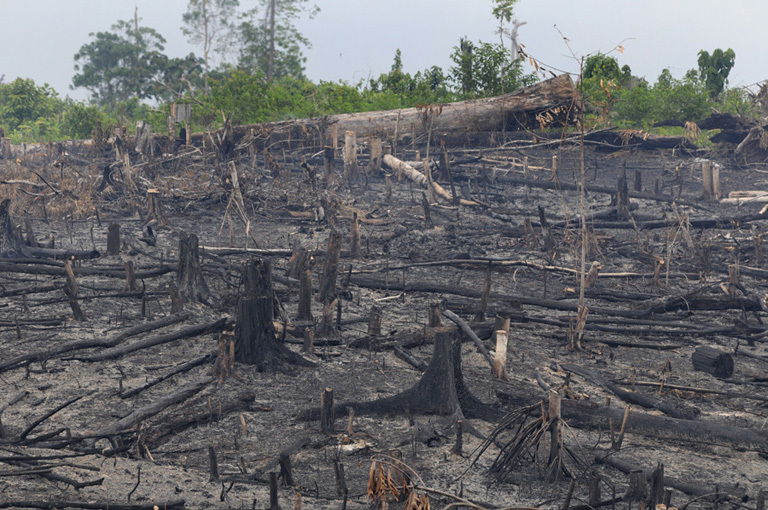 Land cleared by fire for palm oil plantation in the subdistrict of Segah, Berau, East kalimantan, Indonesia. Photo courtesy of BP-REDD+. According to recent research, the Rimba Raya project is the only REDD+ project in Indonesia to have secured funding from carbon markets. Half of the project’s 10 million metric tons of produced carbon credits have been sold. None of these financial compensations make it to the communities that pay the highest costs and take on the significant risks. And that’s standard practice. • Leakage refers to the fact that while deforestation might be avoided in one place, as the root causes of deforestation aren’t tackled, the problem is simply moved to another area of forest or a different country. • Additionality refers to the impossibility of predicting what might have happened in the absence of the REDD+ project. • Permanence refers to the fact that carbon stored in trees is only temporarily stored. All trees eventually die and release the carbon back to the atmosphere. • Measurement refers to the fact that accurately measuring the amount of carbon stored in forests and forest soils is extremely complex — and prone to significant errors. These problems have beset climate offset projects for over a decade. Current crypto-REDD+ initiatives have failed to overcome them. But blockchain does offer partial solutions to consumer-driven climate change. Image courtesy of Pete Howson. Much of the technology needed to connect consumers with forest communities is already here, or in advanced stages of production by groups of independent blockchain developers. 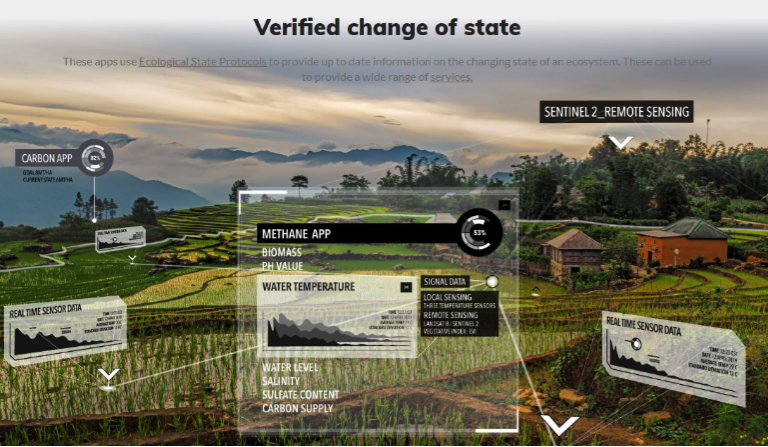 Regen Network, for example, plans to implement a blockchain-based application, which they claim “monitors on-the-ground conditions and generates trusted attestations about the ecological state of managed environments.” Rather than baseline fairy tales, additionalities can be proven by satellites and ‘Proof of Location’ systems. ‘Smart-contract’ apps are also in development, which use autonomous protocols and self-executing code to enable automatic incentive payments to be disbursed directly to forest communities working to improve tropical ecosystems. Cryptonature bubbles of hot air will likely burst or blow away, carrying the un-savvy investor with them. Meanwhile, development of the underlying blockchain technology is likely to bring about radical social and environmental transformations to Indonesia’s forests. Knowing the difference between the greenwashing bubbles and the bona fide game-changers will always be difficult in an unregulated arena. But, if forests are improving while forest communities are getting the lion’s share of the benefits, then that’s a good sign. 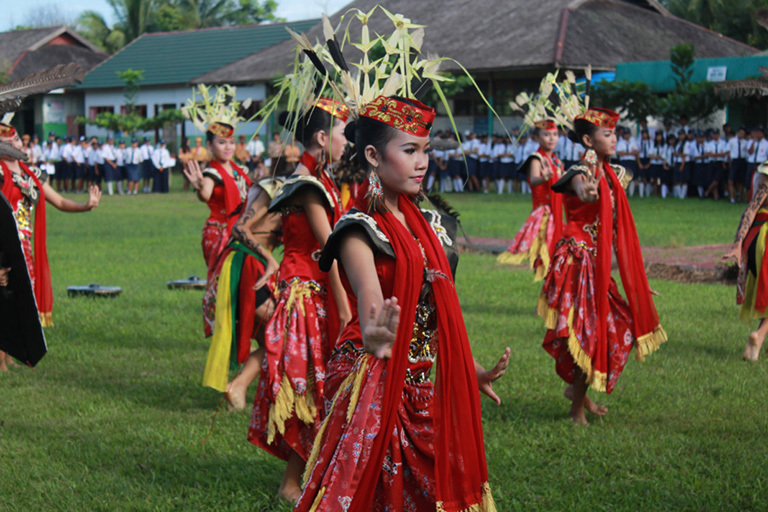 Traditional Dayak dancers entertain dignitaries at a provincial REDD+ event in Palangkaraya, Central Kalimantan. Photo courtesy of BP-REDD+. CORRECTION: This article originally stated that Ecosphere+ was using blockchain technology to find buyers for REDD+ credits from Sumatra’s Merang peatland. In fact, Ecosphere+ has sold a number of carbon credits to Poseidon, which is using them as part of its blockchain platform to allow consumers and retailers to track and offset their carbon footprint. The credits that Poseidon bought from Ecosphere+ are from the latter’s project in Cordillera Azul National Park in Peru. Mongabay regrets the error.